There is an interesting phenomenon where information that is learned is forgotten but without a doubt stored in the brain. Many people may know it as feeling they have lived through a certain situation and having recollection of that moment. Deja Vu is a feeling of familiarity which has not thoroughly been explained by science yet. It has been explained as an anomaly of memory since these feelings or recollections has deemed to be impossible. There are many explanations I have read and researched throughout the years and the most interesting one I've come across has to be a "dream-based" explanation. We get these feelings of having previously seen or experienced something that is currently being seen through dreams of similar situations. Personally, I have expereinced frequent feelings of deja vu and I always believe it iss because I have dreamt about a specific occurrence before. 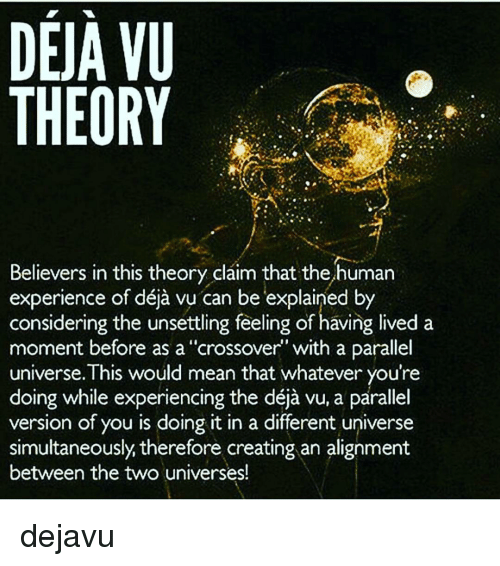 I also believe there is some truth to deja vu being associated with some sort of psychological disorder as well but the challenging part is researchers have said to correlate this feeling with mild seizures. Book Report--- "Why People Believe Weird things"
Report on "This Idea Must Die"